Spring turnout tips to consider when transitioning from winter to early spring pasture. Keep in mind that going from dry hay and grain to lush, green pasture is a drastic change in diet and may increase the risk of founder or colic. Horses that are in the pasture full time will gradually become accustomed to the emerging green grass as it comes up. But horses that haven’t had green grass should only be allowed to graze for an hour or two at first, then gradually increase grazing time by an hour every couple days until the horses are out full time. It is also a good idea for horses to have eaten dry hay prior to turn out so they are not overly hungry. Individual horses will have different tolerance levels to the diet change and the nutritional profile of the grass, so a slower introduction is usually better. Spring pasture often looks beautiful and nutritious but can be very high in water and low in fiber content. 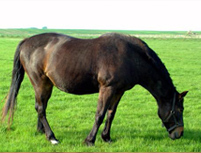 In this stage of maturity, pasture may not meet a horse’s minimum requirement for dry matter intake and it may be necessary to provide 10 to 15 lbs. of dry hay per day until the pasture matures. Even when the pasture is sufficient to maintain horses in good body condition with no supplemental grain, there will still be nutrient deficiencies. Providing a forage balancer product such as Purina® Enrich Plus™ will supply a balance of protein, vitamins, and minerals to complement pasture. This product is formulated to meet the nutrient requirements of mature horses with 1 to 2 lbs. per day, whereas most feeds are formulated to be fed at a minimum of 3.5 to 4 lbs. per day. The very best pastures may support one horse per acre, but average conditions may require closer to 2 to 3 acres to sustain one horse grazing full time. The effective stocking rate will depend on the type of grass, fertilization and rainfall. For shorter varieties of grasses, such as Kentucky bluegrass, pasture must grow 3 to 4 inches tall to provide adequate forage for horses. Taller grasses, including Coastal bermudagrass, should sustain a height of 6 to 8 inches. Stocking rates may be improved if there is an option to rotate pastures. Grazing tall forage varieties down to 3 to 4 inches and shorter varieties to 2 inches in height, then rotating to another pasture for four weeks can help maximize grazing potential of available acreage. Rotating pastures is also a good way to reduce the risk of internal parasite infestation. A good rule of thumb is that if you can see manure piles in your pasture and if horses are grazing close to those manure piles, your pasture is overgrazed and horses should be removed to let it recover. Pasture time is certainly a plus when it comes to managing happy, healthy horses, but not all pastures are created equal. Some pastures provide a significant source of nutrition while others are just a place to play. Providing safe, quality pasture forage that meets a large portion of your horse’s nutritional requirements takes careful management and additional caution during seasonal transitions. Consulting with a horse pasture and forage experts in your area, such as the local county extension agent, a university agronomist or State Extension Horse Specialist, may help you maximize the safety and value of your available pasture. This entry was posted on Wednesday, March 20th, 2019 at 8:28 am	and is filed under Horse, News & Updates. You can follow any responses to this entry through the RSS 2.0 feed. Both comments and pings are currently closed.